The end of the year is fast approaching, and typically the last three weeks are planned out for an end-of-year reflection post, a Happy Holidays post, and a Happy New Years post (in that order)–on jmdesantis.com, that is, where I blog weekly. So that leaves this week as the last week of the year for any topic I choose, and I haven’t put out any information on the state or release of Chadhiyana #3. I don’t have any official news yet, but I will give you all a bit of something, rather than remaining silent until the first full week in January. First, this statement is a bit premature, as there hasn’t been more than a vague date range given to me by Rosarium’s master chief, Bill Campbell. Though, to put the blame on Rosarium for this one would be greatly remiss. Of course, publishing delays happen all the time for various reasons, but the in this case the fault was mine. I had a lot of trouble getting this issue together, for reasons which I will remain silent about, despite giving it my best efforts. And they were my best efforts. Despite the challenges and difficulties, Chadhiyana #3 is probably my best work to date on the series. More, there are some scenes in both this issue and the next issue (#4) which I have been dying to finally get to. I’m hoping those things will make the wait well worth it, especially for those who were reading the Chadhiyana: In the Company of Shadows as a web-comic, as issue 3 begins new, unpublished material. So, when can you expect Chadhiyana #3? Again, there’s nothing official, but based on my last conversation with Mr. Campbell, Chadhiyana #3 couldn’t release any earlier than mid-January, and #4 will have to come out in March. Have to in March, you say? But why? Well, the plan still stands that the first Chadhiyana: In the Company of Shadows trade will release in the Fall of 2016, and the schedule will have to get a little tighter and stricter in the New Year if that’s to be a reality. Though, of course, things are always unpredictable, and Rosarium has lately been internally negotiating how to better pace out its comic publishing schedule (again, I’m just one rose in the garden). 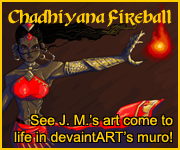 So, my sincere apologies for the delay, but I do promise you, Chadhiyana #3 is coming. 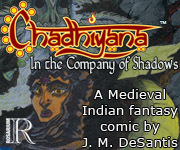 Once there’s something more official, I will certainly make an announcement on both chadhiyana.com and jmdesantis.com. In the meanwhile, I hope the holiday season is enjoyable for you and the year rounds off nicely for us all. Look for further Chadhiyana issues in 2016. It’s only 23 days away! And I promise this will be worth the wait.